CCL Grant Cycle is Now Open! When Christians fully accept the gospel message and put its principles into action, we’re all blessed. The Christian faith is built upon this truth: Jesus Christ, the Son of God was crucified and resurrected so that each of us may have eternal life through a personal relationship with Him. After making a commitment, Christians have the ongoing opportunity -the mandate - to grow and develop their faith and to share the love of Christ, through word and deed. What could our region look like with more Christians demonstrating their faith through tangible action? 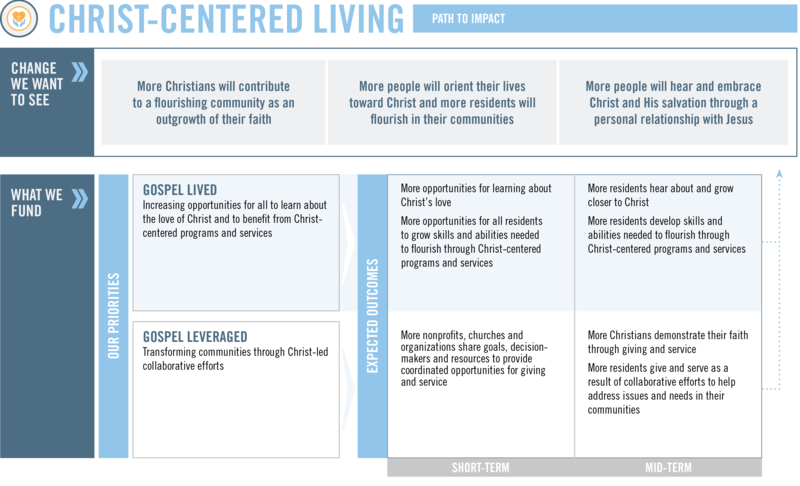 Christ-Centered Living starts with the Christian gospel message, supports meaningful discipleship and learning, and results in believers caring for their communities. Click here to read our Community Approaches for Advancing Faith in the Tri-State Region whitepaper.